There seems a dearth of Finest NGC targets at the moment. That is, for me to capture. With SkyTools, I looked up some interesting objects. 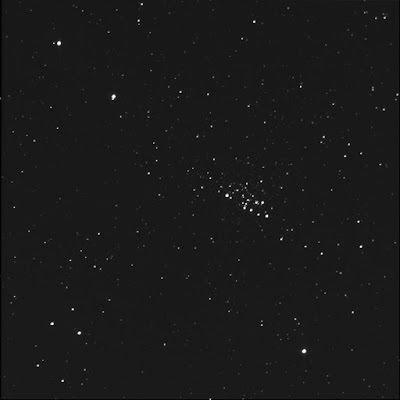 NGC 7510. A compact open cluster in Cepheus. The queue was nearly empty so the BGO 'bot tagged it quickly. Neat! I get a strong sensation of motion, that this gaggle of stars is zipping through space. "Follow me!" Luminance only, 30 seconds subexposures, 10 stacked shots. FITS Liberator, Paint.NET. North is up; left is east. To the north-east of the cluster, half-way to the top-left corner, is an obvious double star. A tight pair with a bright primary and dim secondary. This is HD 240221 aka STI 1150.